Last week, a friend of mine had people in town for a visit and invited me out to dinner with them. I suggested that we try Osteria 166, an Italian “pub-style” restaurant that opened up in Downtown Buffalo last summer. By the end of the meal, we were really glad to have gone there: everyone was pleased with what they ordered, and we all felt that it was really well valued. Our table of our four started off the meal with a round of drinks and two appetizers. 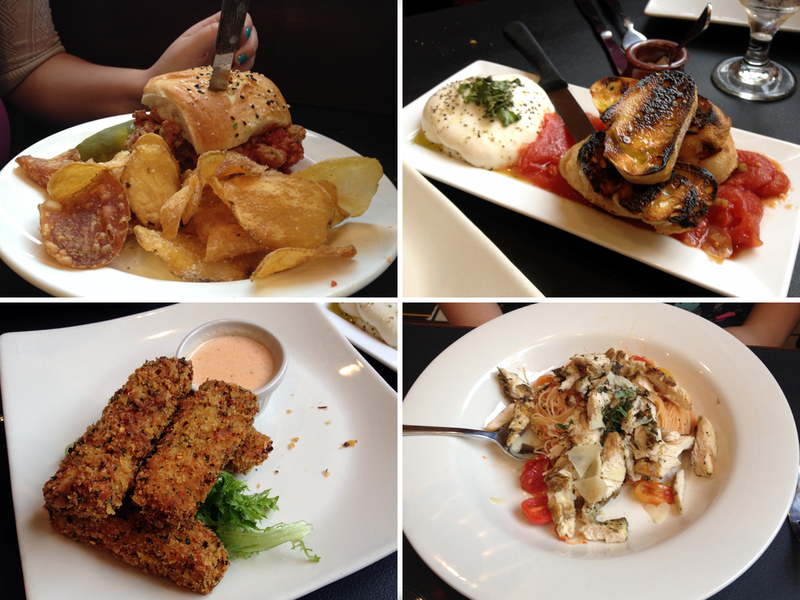 We decided on the House Burrata & Charred Breads ($9) and the Stuffed Pepper Risotto Cakes ($8). The risotto cakes were quite good. Appearing as though they were giant mozzarella sticks, they were stuffed with rice, sausage, and herbs, and perfectly breaded and fried. The most memorable part of the dish was the accompanying pepper cream sauce. The roasted and sharply spicy flavor of the sauce completed each bite of risotto cake and frisée. The burrata, on the other hand, felt incomplete––merely average. It took some effort to get into the (not so) creamy ‘house-made’ ricotta center, and the “stewed tomatoes” tasted as though they were straight out of a can. The small jar of sea salt on the the table became absolutely necessary to bring out the flavors in the dish. On a more positive note, we all received a free glass of house (Frontera) wine due to checking in on Yelp––and for people trying to dine on a budget, free wine is never a bad thing. The entrées were more impressive. We ordered the Porchetta Sandwich ($9), the Woppy Joe ($9), the Pollo & Cappellini ($19), and the Bucatini Carbonara ($19). The two sandwiches were on point. My Porchetta sandwich exceeded my expectations: the pork was thickly shredded, tender, just fatty and salty enough, and was complemented perfectly by the well-toasted roll, thinly sliced red onion, arugula, and Asiago. I was only able to finish half of it at the restaurant, but would have devoured the whole thing if I wasn’t already so full. 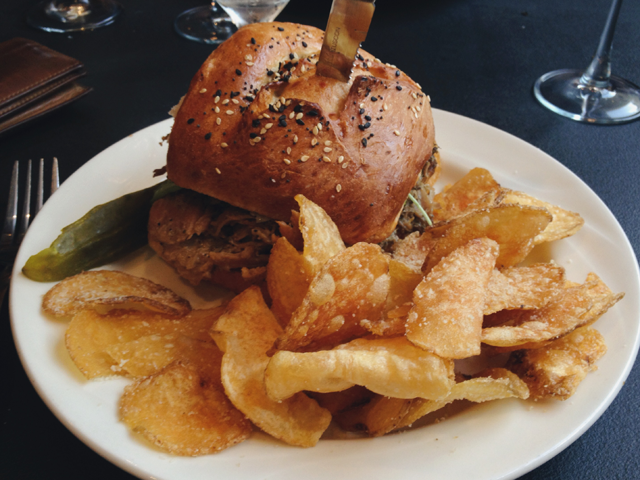 Our friend’s meatball sandwich got a similarly great review, and we both raved about the chips. They tasted like freshly fried kettle chips, and had a burst of flavor from the parmesan and truffle. I typically dislike truffle oil on anything, but it was very faint here and didn’t overwhelm the chips at all. The two pasta dishes were well received too. The pollo & cappellini was liked by our friend who ordered it, but I did notice that the plating seemed a bit messy and dry. The bucatini carbonara definitely stole the show with its thick noodles, rich sauce, crispy pancetta, and raw egg yolk on top. I tried some, and it was really enjoyable. 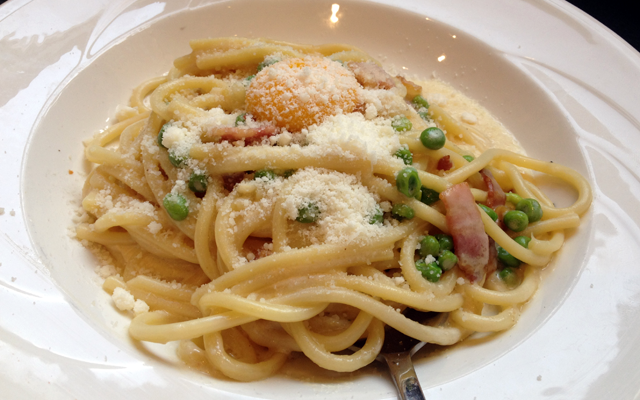 However, I’m quite sure that it was not an authentic carbonara: it was more of an alfredo sauce with peas and pancetta, topped with one egg yolk. While this didn’t detract from the scrumptiousness of the dish, it is bound to disappoint those looking for authentic Italian cuisine. A note about the ambience: we were seated inside, and our only complaint was that it got a bit loud. Other than that, it was spot on: comfortable without being pretentious, and with a good distinction between the nice looking bar area and the more formal dining room. Osteria also has an outdoor patio that I would definitely take advantage of on a future visit. Further, our waitress Kyle was extremely attentive, prompt, and professional; she didn’t miss a beat the entire meal. Lastly, it is worth noting that we ended up paying under $80 before tip for four people and a huge amount of food. Osteria 166 is a restaurant catering to lovers of both Italian food and pub-sized portions, and fits both a family-oriented crowd and those looking for a drink and bite after work. While certainly imperfect, it has definitely carved a nice niche in the downtown restaurant scene and left us with an overall positive experience. Osteria 166 is located at 166 Franklin Street, Buffalo, NY 14202.